Still into v-twins, and with a dead CX, I decided that I could put up with the Virago's cruiser styling for the sake of its engine and shaft drive. I picked this one up with 58000 K's on it and had a ball on it over the course of seven years, coinciding with a time in our lives when shorter day trips seemed to be the thing anyway. It was a fabulous bike for relaxing at legal speeds and enjoying the scenery, yet handled regular dirt excursions and the odd crazy blast through the hills with sports bikes much better than their riders would have liked. It never gave me the slightest trouble aside from needing a clutch cable, steering head bearings, and fork seals. Otherwise, it was just a case of riding it, changing the oil, doing the tappets every so often, and not much else. The donk was a real gem and I really miss it. The short stroke, heavy flywheel, and mild tuning gave a wide spread of relaxing, accessible torque, and the sound from the shotgun pipes was very rustic (but they stink). It got about 18km/ltr (~50mpg) most of the time, even around the city. I put flatter bars on it to replace the silly things they come with standard, and I built a rack for it with a removable, lockable upright piece that serves as backrest and U-lock for helmets and leather jackets (an original design!). The sissy-bar was removed. I ran a 150-section rear tyre which gave it slightly longer legs. 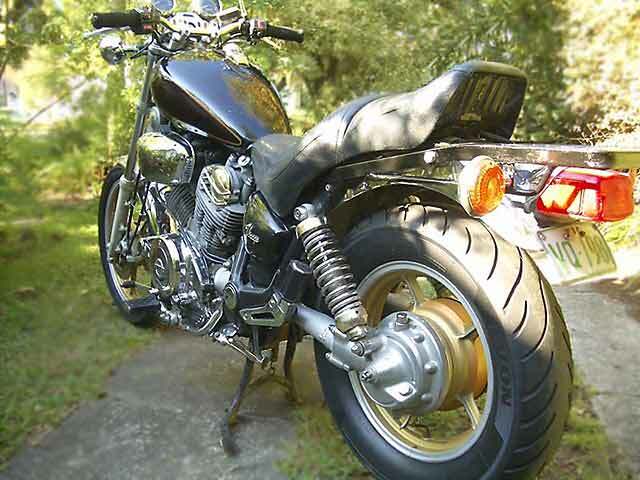 The Virago had its faults. Two-up cornering clearance was even worse than when riding solo. It had stingy rear suspension, too much unsprung weight, a small and nasty pillion seat, a tiny 14 litre tank with no room for a decent tank bag, gearing that was too short, an off-centre engine and centre of gravity that made it pull to the left slightly... But despite such imperfections and its cruiser styling, the classic engine, shaft drive, and general simplicity made it so agreeable that the overall effect for me was years of remarkable contentment. I would never have guessed. I've posted some extra Virago / XV material on another page.